If Conor McGregor beats Floyd Mayweather on Saturday night in Las Vegas, the boyhood Manchester United fan will perhaps owe a small debt of gratitude to Manchester City. For the past six weeks or so, he has driven his green Lamborghini to the UFC's new performance institute on a daily basis. At this hub, located about four miles from the city's famous strip, you can mimic conditions at 10,000ft of altitude, clock miles on an underwater treadmill, or analyse the density of specific muscles. If an athlete is to be built rather than born, this is the place. The attention to detail is stunningly intricate and it was Manchester City's own training complex which offered key elements of the blueprint. A group of journalists are led through the $14m development by Forrest Griffin, a retired UFC light-heavyweight champion and now a vice-president with focus on athlete development. He paints details around what we see at the 30,000 square feet facility, which opened in May. Some 23 years have passed since UFC was formed but this building is seen as a game changer which will take the welfare and performance of athletes to new levels. It is far removed from the spit and sawdust gyms which shaped some of boxing's greatest names. Some 24 hours earlier, I visited the Mayweather Boxing Gym, a world-renowned facility which inside is straightforward, humble and brilliantly effective. But the UFC institute cuts with tradition in pursuit of gains. Measurability, science and mapped progress shape the mantra. Griffin explains how recovery is meticulously plotted. He points to one of his own injuries and a subsequent substantial difference in mass between his two quad muscles, detected after his retirement. A UFC fighter at the Institute would be scanned during rehabilitation to highlight which muscles have suffered during their lay-off so targeted rebuilding can be done. Any fighter competing under the UFC banner can train here at no cost. Tailored workout programmes appear on screens next to weight stations. If an athlete is only here for a short spell, their data and subsequent training plan will be sent to an app to use at their traditional base. Whatever the goal - recovery, strength, mobility, technique - there is a desire to offer a menu of ways to work on it. As Griffin stresses, what works for one individual will do nothing for another. In the recovery area, for example, athletes can opt for use of a cryotherapy chamber or laser-light therapy. Both will stimulate circulation, flushing away lactic acid and easing aches and pains. Facilities are purposely placed one room apart to ease access. We pass through a door and Griffin fires up the underwater treadmill McGregor has been filmed using in recent weeks. "Conor has had a knee injury in the past so he doesn't like to do roadwork," says Griffin, 38. "So he does a lot of bike work and he uses this as it has no impact on your body and you can work hard." Two pools next to the underwater treadmill offer temperatures of 105F and 50F respectively to again offer variety in recovery. Griffin explains why McGregor's typical routine of sleeping in until midday makes perfect sense. "He's been here once or twice a day for six weeks," adds Griffin. "Training at the time you fight is under appreciated. When do you work out the best, after being up for 12 hours or three or four hours? He primes his body to do that, which is intelligent." We are taken to meet UFC flyweight Joe Benevidez, who is receiving treatment from director of physical therapy Heather Linden. Linden left a role at the USA's Olympic Training Centre in Colorado Springs to be here. She jokes when explaining how even the toughest UFC fighters can struggle on a pilates ball when she isolates their weakest muscles in order to highlight where work is needed. "What's been a shock is how little access to services these athletes have had in the past," she says. "It's amazing how some of them have never had medical guidance for preventative measures. "I've had to build trust. I had a guy come in here and tell me he couldn't feel his left arm but he was going to fight. He was scared of telling people in the event he was pulled from competing but with work we restored him to full functionality in two weeks." Former UFC welterweight Dan Hardy is part of the tour. The Nottingham-born 35-year-old describes the facilities as "night and day" to what he used. "My life would be different now," he tells the group. "I used to work with friends for treatment, driving around for different things I needed." Despite all the technology in what feels like the slickest of finishing schools, MMA critics still exist. Perhaps blighted by images of the ground and pound or blood-stained faces they question the morality of the sport. But UFC's growth shows no sign of relenting. The company was sold for $4.2bn in 2016 and listening to Griffin it is obvious this is a sport with vision. Mapping the layout of the Institute saw the UFC research facilities at the likes of Man City, the Phoenix Suns basketball team and the USA Olympic team base. Habits were observed, such as an athlete's occasional tendency to neglect post-workout nutrition if access to it was not made easy. Consequently, UFC athletes can only exit the building by passing a nutritional team. "We learned from mistakes people had made in the past," adds Griffin. "A facility and its staff may be too spread out. Manchester City have a great layout. The locker room is the centre of the building. The athletes start and end in the locker room so you build every service around that. "Every sport taxes the human body a certain way. The needs and demands change but the impact on the body and the recovery needed is very similar." Elsewhere on the ground floor we see anti-gravity treadmills which take away impact, a 50m outdoor track and walls with numbered targets for medicine balls to be thrown at. The altitude chamber McGregor sometimes cycled in is in use. This transparent box lets people look in at the world of pain it can serve up. Griffin proudly states UFC stars can now create conditions to prime them to fight anywhere on earth. In a gym packed with contraptions, he points to pressure plates in the floor. Squatting and lifting weights while planted on these will deliver data on which limbs are offering the greater power. Once more, it offers a way to drill down and improve weaknesses. We are led up stairs boasting the slogan "contenders become champions and champions become legends". These take us away from a ground floor focused on welfare and strength and to an upper tier which measures 17,000 square ft and is MMA specific. Bags of varying shape and size hang there, an octagon dominates the room and of course, there is McGregor's boxing ring, home of those now infamous spars with Paulie Malignaggi. He is of course a fighter obsessed with detail. This desert treasure chest caters for that intricacy in abundance. 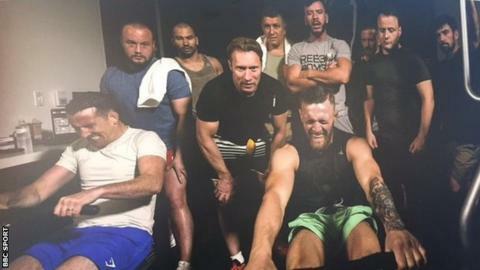 And if all of the facilities have somehow polished him to a point where he can shock Mayweather at the T-Mobile Arena, UFC's main draw will achieve a status which will shine new focus on the company. Its Performance Institute tells us the organisation is nothing but ready to thrive and what is more, it now boasts a factory primed to build the next McGregor.